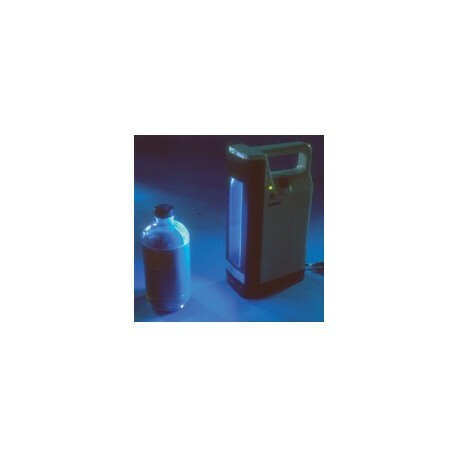 The CON-TROL-CURE™ LONG WAVE UV LIGHT is ideal for use in UV quality control inspection especially in UV fluorescence analysis. The Long Wave UV Light comes with two 6W, long wave (365nm) self-filtered UV tubes. Each lamp utilizes a specular high "UV reflectance" metal reflector, which multiplies and focuses the UV irradiance provided by the lamps. An internal rechargeable battery is included to eliminate the need for replacement battery specially for field requirements. Comes complete with a 115V/220V wall adaptor for recharging. May be used for a wide variety of applications where the need for UV is required. Wavelength: 365nm. Typical peak intensity at 6" is 700-800W/cm.